Yes are very fortunate to have a book like this written about them. If you are interested in purchasing a 16" x 20" signed and numbered, limited-edition art print of "The Messenger of Hope" please contact the artist. Book - published in 1994 by Wyndstar. Text by Thomas J. Mosbø with help from Coral J. F. Mosbø. Cover art ("The Messenger of Hope") by Coral J. F. Mosbø. Artist's Explanation of "The Messenger of Hope"
Before I begin my explanation of The Messenger Of Hope, an oil painting I completed in October of 1981, I would like to say that I fully believe that art speaks its own language to each individual who takes the time to absorb its imagery and allows its essence to speak to them personally. Therefore, even though an artist may have his or her own particular reasons for painting a specific image or idea, and definite thoughts as to what those images may mean, the viewer may pick up on other impressions that the artist never imagined, that in fact add to the strength of the work as a whole. I hope this explanation of my piece does not detract from the artwork’s own language of colour and shape, mood and meaning, but rather adds a unique dimension by including some of the intentions of my own personal perspective. The Messenger of Hope originally represented a likeness of the musician and singer, Jon R. Anderson, of Yes, but which can be symbolic of anyone with a similar calling. The picture portrays a white clad mystic who cradles a small harp in one arm while the other is outstretched to the sky in a gesture of release. He is kneeling on a windswept rocky outcrop. Lightening strikes a barren world behind him, and the sea flows red. Before him dead branches cling helplessly, and a sword lies broken. 1. The harp is significant as it represents the peaceful instrument of the biblical "messenger", which also means "angel". It is used to depict the person as a musician or bard; someone who relays the tales of truth, and sings hope to those who will listen. 2. The outstretched hand is often used in my works to symbolise the ritual of releasing one’s creativity into the world; the powerful act of sending out one’s soul-energy for a specific cause. 3. I have depicted the mystic in a kneeling position to show his submission to the powers that be; his "surrender" to doing God's will, and his willingness to take on this formidable task to be the voice of hope to a generation in need; a musical messenger of peace and harmony in a tumultuous desperate world. 4. 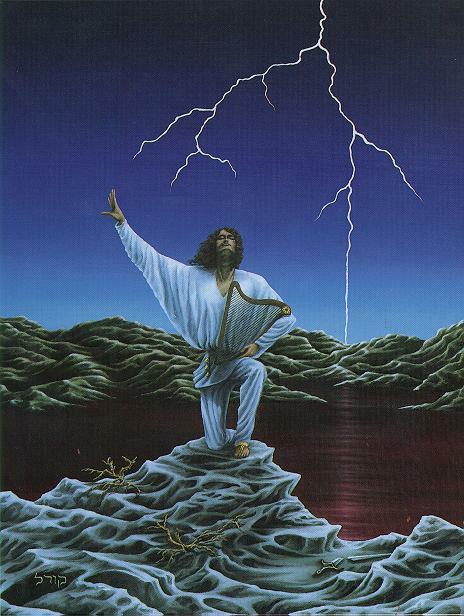 The lightening symbolises the power of God, and His anointing touch. The sky is void of clouds to emphasise that the lightening is supernatural, and not just part of a storm. It shows that God acknowledges the mystic’s surrender, and anoints the messenger with His powerful display of light. 5. The earth is barren and rocky, showing that life here has suffered greatly. The twisted leafless branches reflect the helpless groping of the meeker life¬forms on a planet where compassion and caring have seemingly been lost. Yet the windswept outcrop of rock lifts high its own hope, it strains and pushes with all its earthly energy to raise up the mystic musician on a pedestal to honour his cause. 6. The sea runs red with the blood of destruction from generations of war, hatred, and selfish greed. It represents the massive loss of life, and the many sacrifices which have been made. Yet blood is the river of life, and the element of divine purification. 7. The sword lies broken, cut in twain by the light of the lightening reflected down the barren hills and through the bloody sea to where it meets the blade lying on the rocky foreground. It shows that the ways of war as a means for God are now over. In the past, God used death and destruction to show His might, allowing one nation to become victorious over another as a sign of His favour. People believed in God due to fear of misfortune. However, all of that has changed since the coming of Christ into the world, the true mystic. 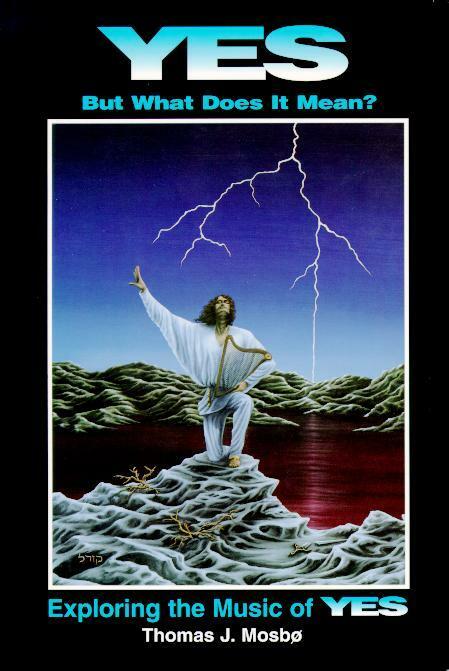 God, by His powerful lightening, has symbolically cut the deadly sword in half. Instead, He has adopted a new method for conquering the souls of humankind. By anointing the mystic, the peacemaker, and the humble artist, as opposed to the soldier or warrior kings of old, He has won the hearts of mankind with compassion rather than brute force. The ways of war need to be over, so that the pathway towards Christian mysticism and holy healing can begin to seed new life into the hearts of all, allowing the earth to flourish with renewed hope and future promise. 8. The mystic musician portrayed is clothed in an outfit that the singer, Jon R. Anderson of Yes, actually wore in concert in 1978 and 1979. But it is also similar to the type of fantasy or Elven attire that I tend to clothe most of my painting subjects in. It is white to represent the purity of purpose, reflecting the truth of God’s white light. 9. The three golden bells have significance in that I often paint them on subjects which represent the Holy Trinity (Father, Son, and Holy Spirit) in some way, or in this case, who represent one of God's servants, such as a prophet, or a person with a divine mission. At the time of this painting we felt that the singer portrayed was like a prophet of God, a simple servant with a holy mission. We believed that his hopeful, mystical message came through his unique voice and lyrics, and the music of Yes. But, such prophets and messengers can be found in the hearts of all true mystics, and those willing to submit to the purposes of Christ. It doesn’t necessarily have to be someone specific for the painting to carry the same significant meaning and intent. 10. And finally, I'd like to comment on the mood of the painting, and the fact that there appears to be no sun. The anointing of the messenger of hope awakens the dawn of a new day. It's gentle glow can be seen beginning to rise over the bleak horizon, summoned by the lightening from heaven, along with the earth’s silent plea for a hopeful voice of peaceful reason to transform the world and make things right.